Welcome to Cowboy Cardsharks - a poker game set in an 1880s-era casino with a 1980s-style interface. Relax and have fun! 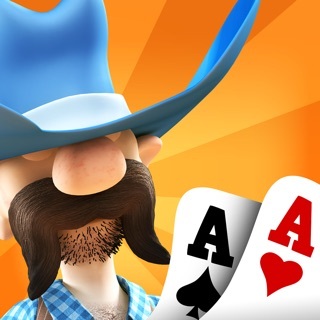 Learn to play poker from four wisecracking cardsharks who will try to take your money! Here in the Old West, you'll play against Annie, Cowboy, Gambler, and The Kid. Each player has his own unique style of play - and playing against those styles, combined with the Hints and context-based Strategy, should help you learn how to play poker. Annie: If you're not careful, Annie will take your money in a big hurry! She doesn't like to lose so she'll fold on a weak hand but bet hard on a strong one. Cowboy: The Cowboy is a tough one to figure out. Sometimes he'll fold on a good hand and bluff a bad one. However, if he has a really good hand, he'll usually bet. Kid: The Kid is in town looking for a good time. He's been in the Casino bit too long and plays loose and passive. He'll make a mistake or two but be careful, he can fool you into losing your money! Gambler: The Gambler is a bona fide "shark" and knows the odds. He plays tight and aggressive which means he'll usually bet on a hand he thinks can win. You have many options for hints and strategy. Hints are displayed to help you decide whether to Bet, Raise, Call, or Fold. The Strategy Mode gives you more information about your hand and your odds of improving. You also have the option of seeing your opponents’ cards during the deal! * Choose your opponents - even play one-on-one! * Volume controls for Sound, Music, and Voice effects. * Tap after fold to speed up game. * Buy the game ONE TIME! * NO in-app purchases to keep taking your money! If you find a bug or enjoy the program, please let us know! Just send an email to support@cowboycardsharks.com. NEW VERSION!! More games. Improved Strategy. Bug fixes. Can’t even finish one hand in any game. Freezes. The back button is the only thing that works at that point and you lose your game. Wish they would fix it. Great app for fast hands of hold'm. Smooth play and easy to use. Love it! Excellent for learning how to play. Amusing comments. © 2013-2018 Useful Software, Inc.